Legendary visual artist William Stout guests on Over Under Sideways Down – LuxuriaMusic.com, Wednesday May 1 3-5 PM Pacific. He will be signing his new book, Legends of the Blues at La Luz de Jesus Gallery on Saturday, May 4 from 6 – 9 PM. 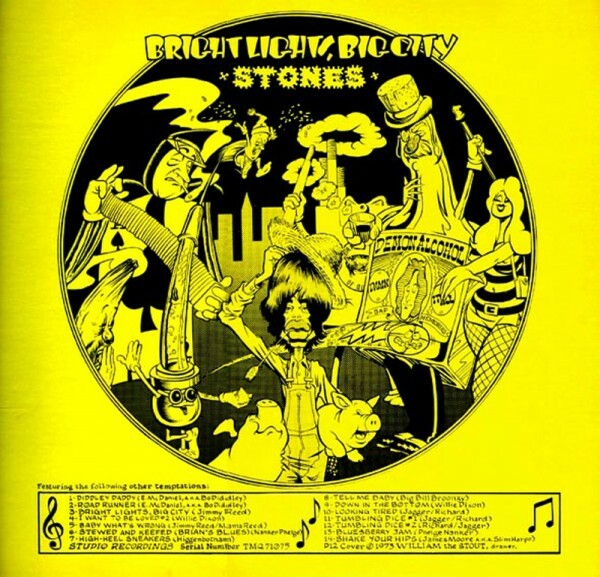 William Stout has a long and varied resume including paleontological illustrations, art exhibitions, feature film storyboards and production art, theme park design and a stint in radio with Firesign Theater. Close to the heart of music fans and record collectors, Stout was the guy who did the fabulous illustrations on the paper inserts and later, deluxe covers that adorned the legendary Trademark of Quality bootlegs in the 1970s (well documented in the book Bootleg: The Secret History of the Other Recording Industry and on Stout’s website.) He also did a stint as art director for Bomp! Magazine. 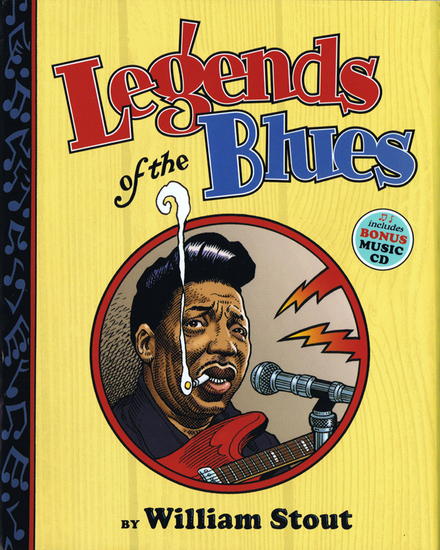 Stout has just released a book / CD called Legends of the Blues. 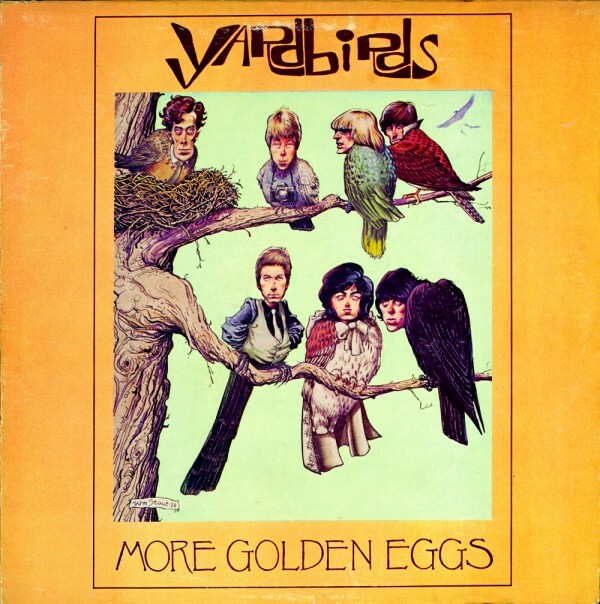 Inspired as most baby boomers by the British Invasion of the 1960s, Stout took a particular liking to The Yardbirds and ended up with the Sonny Boy Williamson and The Yardbirds LP which had a huge impact on him. He purchased a harmonica and dug deeply into the blues – both old and new, amassing quite a bit of blues knowledge and a substantial record collection. Decades later, Stout was recruited to create some artwork for Shout! Factory’s series of CDs by prominent blues artists. 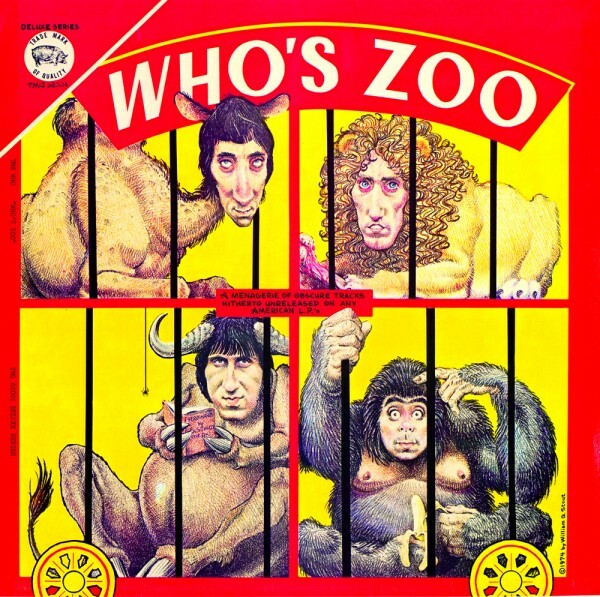 The label had licensed the Heroes of the Blues Trading Cards images created by R. Crumb for the series, but there were several musicians that he hadn’t drawn for the card set. Crumb did not want to create any more blues art so Stout was contacted and asked draw a few images for the series in the same format as Crumb’s card set. And, after he finished the CD art, he kept going – creating more and more images of blues legends and unknowns, even branching out to British and contemporary American bluesmen and women, while recovering from cancer surgery. Stout loves and is passionate about this music, and it shows in his beautifully illustrated portraits and enthusiastic and loving one-page biographies of Robert Johnson, Ma Rainey, Billie Holiday, Howlin’ Wolf, Muddy Waters, Chuck Berry, Johnny Otis, Champion Jack Dupree and others. With the exception of Skip James and Blind Willie Johnson, none of the artists in this book are repeated from Crumb’s Heroes of the Blues card set. This book, including only performers born before 1930, will hopefully be the first of three blues books. The Saturday Night and Sunday Morning – Legends of the Blues bonus music CD compiled and sequenced by Wiilliam Stout features tracks by Big Joe Williams, Mississippi Fred McDowell, Robert Nighthawk, Bukka White, Robert Wilkins, Mississippi Fred McDowell “This Little Light of Mine, Bukka White, Cow Cow Davenport, Big Joe Williams, Bukka White, Robert Wilkins, Mississippi Fred McDowell, Blind Willie McTell, and Buddy Moss. 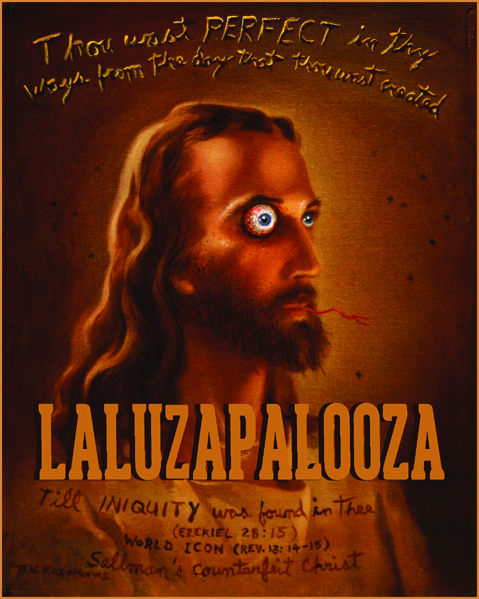 La Luz de Jesus’ 2013 Laluzapalooza / Kitschen Sync Juried Group Show Includes Art by The Creepy Creeps / Creepxotica’s Dave Warshaw! After publicly extending their annual Laluzapalooza juried group show submission deadline an extra month, La Luz de Jesus Gallery‘s Billy Shire and Matt Kennedy sorted through over 15,000 images to select over 220 paintings, drawings, sculptures, assemblages, and photographs to be included in their biggest show of the year. Laluzapalooza patrons will see a noticeable difference in the tone of the show, reflecting a shift toward labor-intensive work of all mediums. Along with work from animators, tattooists, graphic designers, and commercial illustrators, La Luz de Jesus is incorporating photography and digital art into the show. Shire and Kennedy didn’t set out to change the show’s parameters, but several submitted pieces fit the format so perfectly, the duo decided to accept the works and expand the show. They are both confident that there is a “WOW!” factor in this year’s Laluzapalooza which you won’t see in any other group show. 12/8: Cults, Shamanic Gardening, ’60s French Girls – Feral House! * Adam Parfrey discoursing on Secret Societies, Cults and Conspiracy! * Sean Tejaratchi previewing his coming Craphound / Feral House book on Unhappy People! * Shambhalla Institute talks about Shamanic Gardening (their long-anticipated Process Media book). * Erik Knutzen and Kelly Coyne will talk about new Urban Homestead inventions and discoveries! * Mark Edward reveals cold-reading scams that gave him Psychic Blues. * Hear ’60s French Pop Girls, the subject of an upcoming Feral House book! Get a 20% discount on all Feral House and Process Media books. The Martini Kings “Palm Springs Serenade” vinyl LP release, closing party for Brad “Tiki Shark” Parker and Miles Thomspon and Tiki Oasis pre-party! Come have one more look at Brad “Tiki Shark” Parker’s “Tales from the Tiki Lounge” and Miles Thompson’s “Warm Fuzzies, Cold Pricklies“ show and celebrate the release of The Martini Kings’ “Palm Springs Serenade“ LP on Dionysus Records at this combination record release, show closing and Tiki Oasis pre-party. The band will be playing a set and signing their new album, their first on vinyl – 180 gram vinyl with cover art by SHAG and a free digital download code. 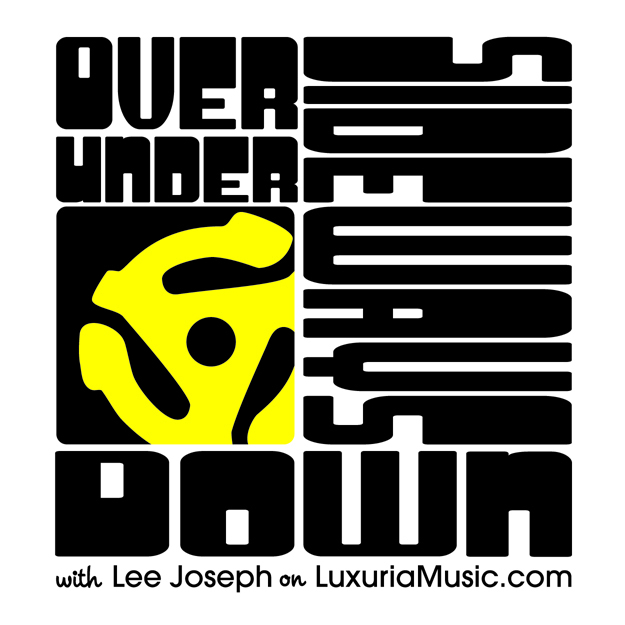 Hi Friends, I’m going to be joining the crew at LuxuriaMusic.com for my very own two-hour, bi-monthly Internet radio show called Over Under Sideways Down, which debuts on Wednesday June 6 from 3pm – 5pm Pacific. I named the show after the beloved Yardbirds song, and the name describes perfectly where I’ll be taking the listener: All over the musical map. Each show will have a different but focused theme. One of the two monthly shows will feature a guest musical or local art luminary who will discuss their past and/or present and share their own and their favorite music. The other show I will do solo, armed with two hours of music and minimal patter. Wed June 6: Tucson, Arizona ’60s Sound Survey with special guest Manny Freiser. The debut show will feature two hours of music and talk about the local Tucson, AZ. music scene in the 1960s. 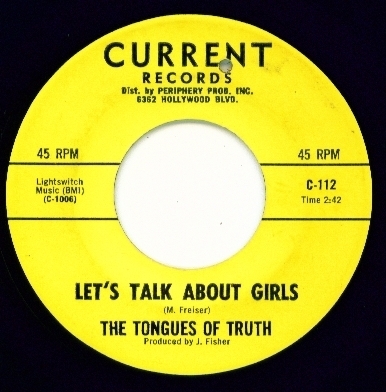 Former member of The Grodes / The Tongues of Truth / Spring Fever and writer of Nuggets classic “Let’s Talk About Girls” will join me in-studio to discuss his experiences in the “Old Pueblo,” adventures in Phoenix and Los Angeles clubs and studios and his surprise discovery that one of his long forgotten compositions’ had become a garage-rock classic. An entire show celebrating the season and featuring a slew of summer, sun, surf and beach songs! Guest Bob Drasnin joins me in-studio to discuss the making of his exotica classic, Voodoo, his exotica comeback album Voodoo II, his big band days, recordings with Red Norvo and his time working in television as composer of music for shows like The Twilight Zone, Mission: Impossible, Wild, Wild West, Hawaii Five-0, Time Tunnel, Lost In Space, Mannix, The Man From U.N.C.L.E. and Voyage To The Bottom of the Sea. We will play some of his recordings, incidentals and his jazz favorites. Two hours of psychedelic sounds; honing in on tracks you probably, or should know. A Gold Star Studio special featuring previously unheard interviews with studio owners and engineers Dave Gold, Stan Ross and Larry Levine with music and jingles recorded at the studio over their three plus decade existence. East Side Sounds – Featuring a slew of East LA tracks from the early ‘60s through the early ‘70s with guest, East LA luminary Mark Gurerro. Passion for Power – Featuring ‘60s power-pop and ‘70s – ‘80s Mod/power-pop revival tracks. Bubble Glam – A mix of bubblegum and early glam. Monstereo – A mono/stereo listening session featuring tracks mostly spanning 1966-1969 though I may throw in some exotica records too. I will play select mono/stereo mixes back to back and ask the listeners to comment (via chat room or email) on which ones they like best. Comment highlights will be featured on the Dionysus Records blog. Do the Funky Ripple, Fletcher! – Two solid hours of soul and funk. Why Don’t We Do It On The Road? – A mixture of live and fake live recordings. Out of Vogue – Songs from the 1940s Vogue 78 RPM Picture Disc catalog as well as other 78 RPM treasures. I’m also planning shows focusing on ‘50s R&B/doo-wop, rockabilly, exotica and more, and will be inviting special guests to share their stories and songs. 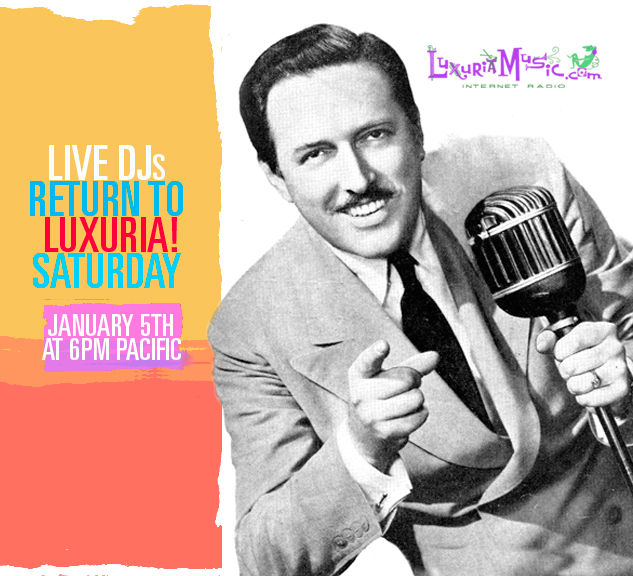 Please tune in, and if you can’t listen live, the shows are podcasted right after broadcast and archived on the LuxuriaMusic site. 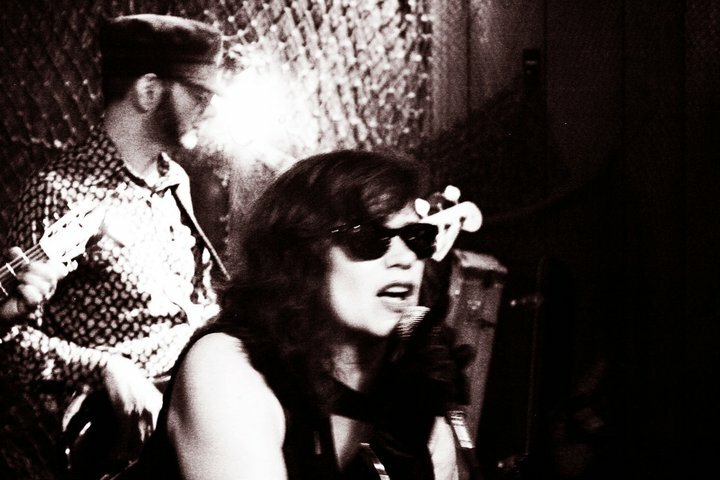 Cheers – See ya in the LuxuriaMusic.com chat room! FREE – No Age Limit! plus other special guests TBA! On the last Thursday of each month, Southern California’s axis of underground pop culture, Wacko / La Luz de Jesus Gallery hosts Billy’s Thursday Night Fish Fry & Community Social. The monthly event presents a diverse multi-media mixed-bag variety show of acoustic based music, spoken word, unusual performance and more. Billy Shire calls the night a “21st century salon” and aims to re-connect the local creative community with a free, two plus hour “in the round” show, with the performers in the center of the gallery. The show is open to all ages and there is no cover charge! This month, La Luz de Jesus Gallery presents their yearly juried group show freshly rechristened “Laluzapalooa.” This gigantic, no-theme show features works from from commercial illustrators, graphic designers, tattooists, scenics, students, street taggers, animators and working gallery artists. This tastefully, jam-packed, salon-style exhibition features some familiar names from La Luz de Jesus Gallery’s ever-growing roster of feature artists, and an overwhelming number of pieces from brand new undiscovered, emerging talent.